Is Sharp dropping the ball? 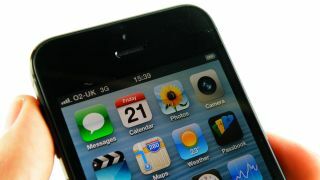 Apple reportedly moved 5 million iPhone 5 units in the device's first weekend on sale, but that seemingly impressive number actually falls below some analysts' low-end predictions, according to a recent report. That may be due in part to an iPhone 5 shortage at some U.S. retailers like Best Buy, RadioShack, and Target. In fact, some locations received less than a dozen iPhone 5's to sell on the handset's release date last Friday. Now a possible explanation for that shortage has come to light, and it seems Sharp's display production line could be to blame. Apple turned to manufacturers LG and Sharp for the task of supplying iPhone 5 screens, but it seems delays at Sharp resulted in the apparent iPhone 5 stock shortage. Sharp reportedly didn't begin producing iPhone 5 displays until the smartphone's debut earlier this month, which could certainly explain why it's in short supply at some retailer stores. The iPhone 5's display is a half-inch longer diagonally than that on previous iPhones, and reportedly costs $7 (UK£3, AU$6) extra to produce because of its larger size and in-cell touch screen technology. That tech integrates the display and touch panel into one layer, making for superior colors but apparently also producing new production headaches. This report comes primarily from an IHS iSuppli analyst cited by Bloomberg, but TechRadar has also reached out to Apple for comment. The iPhone 5 is a huge launch not just for Apple but the entire consumer mobile market, which makes it a major target for critics. However, it seems like Apple's latest money maker suffers from an unusual number of defects, even by Apple's standards (let's not forget the iPhone 4 reception debacle). Reports of light leaks around the edge of the iPhone 5 began flooding in on Monday, and early adopters have complained of the smartphone's particularly scratch-prone chassis. Apple may be gearing up to deal with these complaints while simultaneously battling against the iOS 6 "maptastrophe" and day-one iPhone 5 jailbreakers. Yep, that's right - it took less than a day for hackers to have their way with the iPhone 5. Despite these issues, the iPhone 5 sales in the first weekend totaled a full million more than iPhone 4S sales in its first weekend last year.